Madison Oil has merged with J.J. Sullivan as of January 2016. 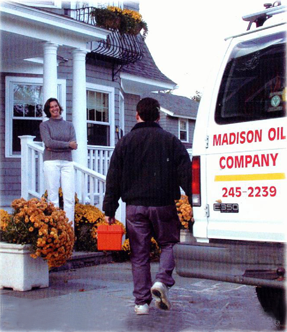 Madison Oil provides our community complete heating, cooling and fuel oil delivery services. As a local, family-owned company we limit our service area to Madison, Clinton, Killingworth, and parts of Guilford to ensure reliable, timely response for any of your heating or cooling needs, including 24 hour emergency service availability. Owners Bill & Angela Carroll have maintained the Madison Oil tradition of keeping your family safe and warm through the coldest winters, and comfortable through the hottest days of summer. Madison Oil provides comprehensive, licensed, HVAC services throughout Madison, Clinton, and Killingworth. Whether you need a new air conditioner, a new heating system, automatic fuel oil delivery, or a simple recommendation and tune-up of your existing heating system, Madison Oil is the proven choice for your family's comfort. Call today and speak to Bill about any of your energy needs and you will see that Madison Oil provides truly personalized service by people you can trust.